Teaching students to evaluate sources—for accuracy, bias, and agenda—and to use them effectively despite their weaknesses, presents a challenge, and yet is essential in today’s crowded media landscape. Most humanities and social science teachers spend at least some class time helping students develop a critical eye for documentary evidence. Using the fictional informational sources J.K. Rowling presents in Harry Potter and the Deathly Hallows to understand Albus Dumbledore’s troubled youth can provide students the analytic skills they need through an entertaining exercise. The Harry Potter stories intrinsically value the past, though Rowling is not naïve about the difficulty of understanding the truth from flawed sources. Throughout the series, but particularly in the last book, characters must weigh evidence and gain important information from biased sources to help them determine their future actions. Conflicting views of Albus Dumbledore in The Daily Prophet, Rita Skeeter’s book The Life and Lies of Albus Dumbledore, and Aberforth Dumbledore’s eyewitness testimony about his brother, raise questions about the Hogwarts headmaster’s motivations and moral integrity. Only by sorting through these contradictory accounts can Harry, Ron, and Hermione defeat the evil Lord Voldemort. When muggle students sort through these fictional accounts from the wizarding world, they nevertheless gain experience needed for navigating real-world sources to determine their own future paths. As a result, this exercise allows students to develop their critical thinking skills and their sense of historical consciousness. With cries of “fake news” at every turn, the urgency for teaching critical reading skills has mounted in recent months. Teaching students to evaluate sources for quality and usable content remains a constant challenge at almost every educational level. Despite the topic’s relevance, students are likely to approach the material with either an indifferent shrug or rolling eyes, chin in palm. For historians, the ability to analyze sources of information about the past and to use them appropriately has always been a central requirement of the discipline. But any educated person must have these abilities. Most humanities and social science teachers spend at least some class time discussing how to regard documents and other evidence with a critical eye. Although today we find ourselves inundated with information, most of our sources are not vetted by experts, are partisan (with varying degrees of openness about their bias), or have entertainment instead of accuracy as the top priority. Given this crowded yet flawed information landscape, evaluation of the quality and content of source materials has become a more essential skill than ever before. Students will find even more valuable the knowledge of how to use inherently biased sources effectively as evidence. Pop culture approaches to source materials can make this rather workmanlike topic more immediately interesting to students. A useful and suitably complex exercise asks students to evaluate sources within the wizarding world of Harry Potter, particularly focused on the topic of Albus Dumbledore’s uncertain past. It may seem counterintuitive to base an assignment about source accuracy on a fictional text—and fictional informational texts within it—but the key is the thinking process behind discerning source limitations and strengths. By developing the analytic skills to examine and effectively use documentary evidence about past events, even imaginary ones, students can apply this critical thinking to real-world situations. Developing critical evaluation in a relatively politically neutral subject area helps students and faculty focus on the skill itself instead of politicized content. J.K. Rowling possesses a surprisingly strong critical sensibility about historical (and other) sources, which makes her books ideal for this kind of exercise. Requiring thoughtful decision-making about what happened in Dumbledore’s youth, this assignment helps students develop the essential skills needed to assess the quality of sources, identify the role played by their own expectations and biases, and even determine how to use imperfect accounts by biased authors in nevertheless responsible ways. In the Harry Potter universe, the past is never far removed from present-day problems. Rowling builds into the fabric of her stories an urgent need to know what really happened in history. In “Hermione Raised Her Hand Again: Wizards Writing History,” Anne Rubenstein examines the way that socially accepted history (what historians call “social memory”) butts up against scholarly sources in the wizarding world, with very serious consequences. She notes, “A historian who asks just the right question and uncovers just the right evidence to answer the question and interprets the evidence in just the right way can end up challenging what everyone believed the story of the past to be. And once in a while, changing the official story of the past changes the present as well” (310-311). Rubenstein examines the variety of sources wizarding-world characters use to discover information about the past, including official ones and counter-cultural or hidden ones. Her most significant take-away is the value Rowling places on historical knowledge and the ability of her characters to sort through many different kinds of accounts of the past in order to solve current problems. In underscoring the usefulness of the past to the present, Rowling acknowledges what scholars of history and pedagogy have learned in recent years: that people intuitively know that the past is relevant and useful to the present, but that their confidence about where to find accurate information is low. In The Presence of the Past: Popular Uses of History in American Life, Roy Rosenzweig and Daniel Thalen explain the results of a survey of Americans about their sense of history’s relevance, and where they might find the most accurate sources. Their study revealed that Americans have a strong sense of the usefulness of the past to the present, but that they distrust both commercial sources of historical information and official ones (like textbooks and school teachers). Instead, they tended to value most the personal testimony of people who have lived through historical events. This connection people feel to the past (if not to historians or history books) is vital to human endeavors. Klas-Göran Karlsson refers to “historical consciousness” as “a time compass that assigns meaning to past events and directs us to future projects” (129-130). As such, it is an essential tool for all citizens to be able to use. Rowling’s depiction of a highly personal past demonstrates this same sensibility. In the final book in the Harry Potter series, Harry uses his conclusions about Dumbledore’s youth as a “time compass,” pointing him to the next steps on his quest. Harry’s detachment from his own roots makes his development of critical thinking about the past more difficult, yet also more necessary. His status as an orphan targeted by the evil Lord Voldemort and the Death Eaters stems from a past of which he has no memory, his parents’ involvement in a conflict that continues from their generation to his, and living friends and foes among those who experienced the prior conflicts. As a result, Harry must become adept at uncovering valid sources of information about what occurred before he was born. His friends assist him in this regard. Ron Weasley, as a wizarding-world insider, inherits and absorbs common knowledge (social memory) about the past from his family. Hermione Granger is an outsider like Harry who learns of the past through authoritative sources like their history teacher Professor Binns and books, specifically Hogwarts: A History. Harry must also identify and exclude invalid sources of information. Some presumably authoritative sources, like the Daily Prophet, reveal how easily they may be manipulated by either government censorship or the desire to pander to a fearful paying customer. Hermione also becomes wise to the (to her, unforgiveable) omissions in Hogwarts: A History when she learns of the role house-elves’ unpaid labor played in the school’s history; she claims the book should be renamed A Highly Biased and Selective History of Hogwarts, Which Glosses Over the Nastier Aspects of the School (Goblet of Fire 238). Harry’s very survival in the present depends on the ability to analyze sources of history. But, importantly, so does the ultimate victory of good over evil. For the most part, Harry gleans relevant details from conversation with adults who lived through past traumatic events (the favored historical source of respondents in Rosenzweig and Thalen’s study), Hermione’s research, and occasional magical intervention like the Pensieve, which recreates the historical memories of individuals. A crucial conflict emerges, however, when Albus Dumbledore dies in the sixth book. Harry has lost one of his chief and most credible sources of information about the past, present, and future. Indeed, the end of every prior book in the Harry Potter series involved a usually lengthy commentary on past events and how they relate to the present, either by Dumbledore himself or facilitated by him (as with Barty Crouch, Jr.’s veritaserum revelations at the end of Book 4). Now that authority is silent. Harry will have to go forward with Dumbledore’s plans to defeat Voldemort without his mentor’s reassuring presence or valuable historical perspective. Harry will have to find his own perspective on the past in the last book in order to complete his quest. Unfortunately, in the seventh book Harry discovers that perhaps Dumbledore was not the man he thought. He encounters sources about Dumbledore’s youth that seem to contradict Harry’s personal understanding and that consequently call into question his mission in the present to fulfill Dumbledore’s quest for the horcruxes. Harry will have to decide how to weigh these sources about the past in making his own decisions in the present. He will find truth in unexpected, undeniably biased sources, ones that contradict his personal understanding of Dumbledore’s role in wizard history. He will agonize over the idea that Dumbledore’s past was complex and perhaps tainted by impure motives and aims. The end of the last book will show Harry confronting his own memory of Dumbledore and coming to terms with his mentor’s uncertain past. In the process of revealing these personal struggles that will determine whether good triumphs over evil in the end, Rowling provides readers with an opportunity to consider how to evaluate a variety of sources about the past. Harry comes to accept uncritically what we might think of as the social memory of Dumbledore, based on his heroic defeat of Grindelwald, especially when it is confirmed by Dumbledore’s mission to defeat Voldemort in the present. Importantly, this understanding of the headmaster conforms to the image shared by the adults around Harry—Mr. and Mrs. Weasley and the other Hogwarts faculty, for example—and therefore preserves an uncomplicated, heroic image of his mentor. But in Book 7, The Deathly Hallows, Harry encounters new sources of information that tell him unexpected, important details about his deceased mentor. One he is inclined to agree with: Elphias Doge’s starry-eyed eulogy appearing in the Daily Prophet, which Harry reads early in the book. The other comes from shady journalist Rita Skeeter: a salacious exposé entitled The Life and Lies of Albus Dumbledore. Harry hears unsavory rumors about Dumbledore’s past from Ron’s Aunt Muriel, and then reads Skeeter’s promotional interview in which she heavily criticizes Doge’s account. He reads an excerpt from the exposé much later that, despite its scandal-mongering, nevertheless throws into question everything that Harry thinks he knows about Dumbledore’s character and ambitions. Toward the end of the last novel, when the children meet up with Albus’s brother before the Battle of Hogwarts, Harry will hear Aberforth Dumbledore’s eye-witness testimony, another undeniably biased account that nevertheless contains important elements of truth. Rowling presents these sources for her readers so that we are similarly drawn to question their accuracy as well as what we thought we knew about Albus Dumbledore. Each of these accounts describes occurrences at the Dumbledore household shortly after Albus’s completion of Hogwarts and in between the deaths of his mother and his sister Ariana. For this exercise in source evaluation, students should read the documentary source excerpts Rowling provides in the text of the seventh novel. The two main sources are published documents: the first, the Daily Prophet’s eulogy, and the second, an unauthorized (and, we are told, lengthy) biographical book. “Albus Dumbledore—Remembered”: Doge’s eulogy of his friend mostly confirms Harry’s perspective on Dumbledore’s life, but reveals that there were complexities in his youth of which Harry has been unaware. As a former schoolmate, Doge portrays Dumbledore as the heroic defender of muggle rights, the powerful victor over the dark wizard Grindelwald, and a modest man who remained active in the politics of the wizarding world without seeking its highest office, Minister of Magic (Deathly Hallows 16-20). “The Greater Good”: the chapter excerpt from Skeeter’s exposé, The Life and Lies of Albus Dumbledore, throws Harry’s understanding of Dumbledore into serious question. Students should read a little before the excerpt in order to see the note that accompanied this copy of the book, which Skeeter gave to Bathilda Bagshot as “thanks” for being interviewed (“You said everything, even if you don’t remember it” (Deathly Hallows 352)) as well as the caption for the picture of Dumbledore standing with “his friend” Gellert Grindelwald (353). This except dwells with malicious glee on Albus’s “missing year,” during which he befriended the young dark wizard and penned a letter (also excerpted) advocating for wizard dominance over muggles “FOR THE GREATER GOOD” (352-359). Students will evaluate these two main sources for their quality and should compare them to see where they corroborate each other and where they disagree. To facilitate questions about bias, students should also examine “Dumbledore—The Truth at Last?,” the Daily Prophet’s interview with Skeeter as a promotion of her soon-to-be published book (Deathly Hallows 22-28). This interview appears in The Deathly Hallows immediately after Doge’s eulogy, and allows us to see both Skeeter’s view of “Dodgy” Doge’s limitations as a judge of Dumbledore’s life and character, as well as her particular biases and quite unsavory journalistic methods. Based on these three readings, evaluate the quality and reliability of the two main sources (by Elphias Doge and by Rita Skeeter). What are their perspectives, what evidence do they have, how useful is that evidence, and how well do you think they represent the truth about Dumbledore’s past? Ultimately, explain what you think a person reading these two descriptions can know about Dumbledore’s youth. What does this tell us about historical biography in general? A short assignment like this allows the students to wrestle with the material outside of class and bring their own impressions, supported by evidence, into the discussion. This exercise may, of course, be done entirely in class, with students given this charge individually or in groups. The benefit of coming in with prior preparation is that students will have considered the documents at more length and probably in a more deliberate fashion. The benefit of carrying out the whole assignment in class is that students who have not previously formed an opinion may be more open to persuasion by other points of view. Either way, students will grapple with the key questions of what makes a source useful and whether biased sources (which each of these obviously is) can provide “true” information. Whether they have prepared in advance or not, students in discussion should consider some of the following questions. Why did Doge and Skeeter write their accounts? How do their purposes affect the validity of their versions of Albus Dumbledore’s life? What are Doge’s and Skeeter’s personal perspectives on Dumbledore, where do their perspectives come from, and how to do they show themselves in these documents? Do these perspectives amount to a detrimental “bias”? Why or why not? On what authority do Doge and Skeeter claim to know the truth about Albus Dumbledore? Are these believable claims? How might they be challenged? What sources do Doge and Skeeter rely on? Which of these has the most authority as evidence? Which are, therefore, the most believable? How do Skeeter’s methods of getting information affect the reliability of her evidence? Do you find Skeeter’s implication that she used veritaserum believable and does this enhance her credibility or detract from it? Based on this analysis, what can a savvy reader determine to be likely true from these accounts? How can we reconstruct at least parts of Albus’s “missing year”? What questions remain that cannot be satisfactorily answered by these sources? Where might wizards look for answers to these? Once students have evaluated these written sources, show them the “oral” testimony of Albus’s brother Aberforth Dumbledore for comparison (Deathly Hallows 563-567). Harry, Hermione, and Ron ask Aberforth about the events of that pivotal year and listen to his version of events. Bitterness toward his high-achieving older brother colors Aberforth’s description of Albus’s friendship with Grindelwald and treatment of their sister Ariana. Students should consider whether this eyewitness account constitutes a more authoritative source of information than Doge’s or Skeeter’s and evaluate Aberforth’s biases, some of which were pointed out in Skeeter’s interview and book. Aberforth’s motives for talking about these episodes—for the first time, we’re told—should be a part of the discussion, as well. Does this testimony confirm or undermine the version of events we determined from the published accounts? Do we see Aberforth as a better source, given that he was an eyewitness to many of the events discussed? Or do those standing at a remove from history have better access to “the facts”? What does this tell us about who can speak authoritatively about historic events? Does this show that we value oral testimony more or less than we should? Do Harry, Ron, and Hermione consider this to be a definitive account? How does hearing from Aberforth affect their course of action? Students who have read the Harry Potter series will have an advantage in some respects in this last part of the conversation, but their knowledge of the larger story may also play into their judgment on these accounts. In the last book, even after his death, Albus Dumbledore has laid out a course of action for Harry, Ron, and Hermione: for them to seek and destroy the horcruxes so that they may defeat the evil Voldemort. Dumbledore’s own youth, however, reveals that he, like Voldemort, searched for the Deathly Hallows instead—the elder wand, the resurrection stone, and the invisibility cloak, which together defeat death. Harry must decide whether to seek the hallows or the horcruxes, and his doubts about his mentor’s moral purity make him question Albus Dumbledore’s direction. Aberforth tells his version of events in order to discourage Harry, Ron, and Hermione from entering Hogwarts to seek the remaining horcruxes. The three protagonists will have to sort through the varied accounts of Dumbledore’s youth in order to decide their course to victory. Ultimately accepting a less-heroic image of the Hogwarts headmaster, the Trio will nevertheless pursue his path in seeking horcruxes instead of hallows. This does, indeed, lead to the victory of good over evil. Knowing this result in advance may cause students to look at the documents differently. It may be useful to ask students about whether they think their prior knowledge of the Harry Potter story influenced their decision-making in this exercise. To cap off this exercise, students may be encouraged to read Harry’s conversation with the deceased Albus at King’s Cross station toward the end of the novel, in which they discuss his guilt and temptation by dark magic (707-723). This passage contains clues that this is not the actual Dumbledore, but rather represents Harry’s cohering understanding of this complex man (Perez). Students might consider the degree to which various sources influenced Harry’s perspective in the end, and whether they arrived at conclusions similar to Harry’s from a critical reading of all the available sources. Although this exercise uses fictional sources in a fantasy universe, it can—paradoxically perhaps—help students find the unexpected relevance of sources about the past. Ask students who know the larger Harry Potter story how a different interpretation of Dumbledore’s past might have changed Harry, Hermione, and Ron’s actions, and thereby changed the story’s outcome. How are interpretations of the past in the present, muggle world affecting both personal and political decisions? Where do they see this in their own lives? Have they ever had the experience of learning something new about the past that shook their understanding of themselves in the world or their sense of what they should do in the future? As students navigate research projects of various kinds, they will need to be able to evaluate the quality and usefulness of their sources. More than that, they must be able to find what is useful even in problematic sources. Rare indeed are pure and unbiased sources of information. In their absence, we are all called upon to find what is true and important even in flawed materials. This exercise can help students to go even further than identifying bias; it can help them to determine how to use biased sources for valid research anyway. What could be more useful in our often unfair and unbalanced world today? Karlsson, Klas-Göran. “Processing Time—On the Manifestations and Activations of Historical Consciousness.” Historicizing the Uses of the Past: Scandinavian Perspectives on History Culture, Historical Consciousness and Didactics of History Related to World War II. Eds. Helle Bjerg, Claudia Lenz, and Erik Thorstensen. Transaction Publishers. 2011. 129-144. Perez, Jeanina. “Magical Rememory: How Memory and History Collide to Produce Social Change in J.K. Rowling’s Harry Potter Saga.” Southwest Popular/American Culture Conference. Alburquerque, New Mexico. February, 2016. Presentation. Rowling, J.K. Harry Potter and the Deathly Hallows. Arthur A. Levine Books (Scholastic). 2005. Rowling, J.K. Harry Potter and the Goblet of Fire. Arthur A. Levine Books (Scholastic). 2005. Rosenzweig, Roy and David Thalen. The Presence of the Past: Popular Uses of History in American Life. Columbia UP. 1998. Rubenstein, Ann. “Hermione Raised her Wand Again: Wizards Writing History.” Harry Potter and History. Ed. Nancy Reagan. John Wiley and Sons. 2011. 309-321. Kathryn N. McDaniel is Andrew U. Thomas Professor of History and Chair of the Department of History, Philosophy, and Religion at Marietta College in Marietta, Ohio. Although her specialty is early modern British history, she teaches a wide variety of courses in world history, modern European history, feminism, history of science, and historiography, and is the editor of Virtual Dark Tourism: Ghost Roads. In addition to teaching a course on Harry Potter and the Liberal Arts, she has published several articles on Harry Potter scholarship and pedagogy, hosts the MuggleNet podcast “Reading, Writing, Rowling,” and is the co-editor of Harry Potter for Nerds II. McDaniel, Kathryn N. “Dumbledore’s Uncertain Past: A Harry Potter Approach to Evaluating Sources. 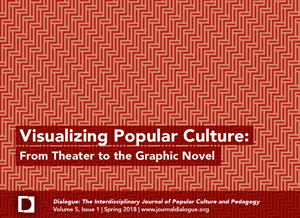 Dialogue: The Interdisciplinary Journal of Popular Culture and Pedagogy, vol. 5, no 1, 2018 http://journaldialogue.org/issues/v5-issue-1/dumbledores-uncertain-past-a-harry-potter-approach-to-evaluating-sources/. McDaniel, K. N. (2018). Dumbledore’s uncertain past: A Harry Potter approach to evaluating sources. Dialogue: The Interdisciplinary Journal of Popular Culture and Pedagogy. 5(1). http://journaldialogue.org/issues/v5-issue-1/dumbledores-uncertain-past-a-harry-potter-approach-to-evaluating-sources/.